Unlike the store bought version, homemade marshmallows have a soft and puffy texture with delicious flavor making them a unique holiday treat. 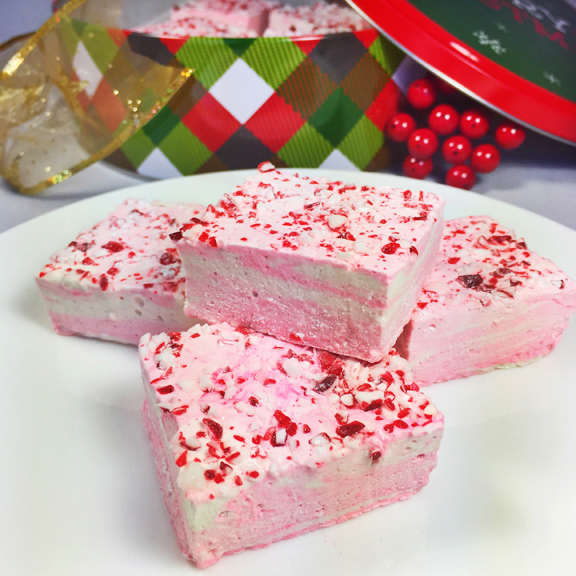 Perfect for gift giving, peppermint marshmallows are ideal for floating in a cup of hot cocoa or just eating out of the tin. While the recipe is not complicated, it does take a little time and requires a candy thermometer. Brush a 9×13 sheet pan, bottom and sides, with oil then line with a piece of parchment to cover the bottom. Add the gelatin to ½ cup water to bloom; set aside. Over medium-high heat, in a heavy-bottomed saucepan combine the sugar, syrup, and honey with 1 ½ cups of water stirring to dissolve the sugar. Bring to a boil, and stop stirring when it reaches a boil. 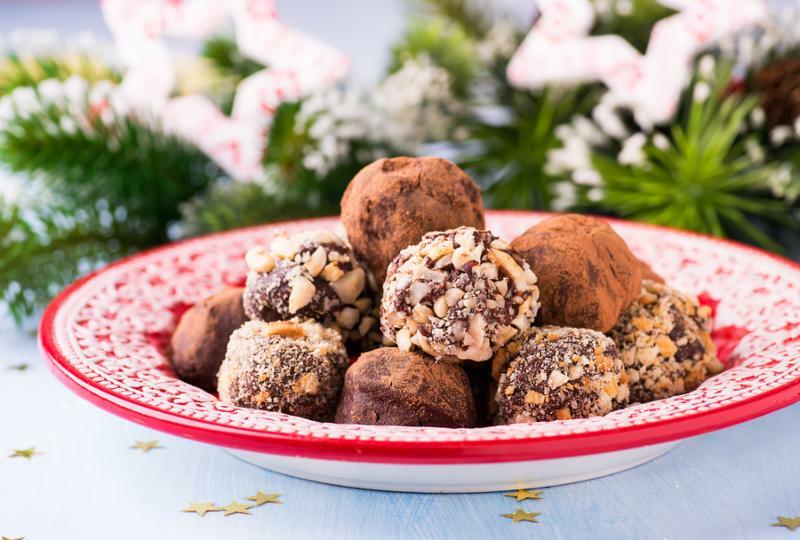 Wash down the sides of the pan occasionally with a brush dipped in water and continue to cook without stirring until the sugar reaches 252 degrees on a candy thermometer. The sugar mixture should be a light caramel color. Remove from the heat and cool to 210 degrees. While the syrup cooks, melt the gelatin in a bowl set over a saucepan of simmering water making sure the bowl doesn’t touch the water. When completely melted and warm, remove from the heat and stir the peppermint extract into the gelatin. When the sugar mixture reaches 210 degrees, add the gelatin mixture and stir until well combined. Pour into the work bowl of a stand mixer and add the whisk attachment. Whip on high until soft peaks form and the marshmallow turns white and shiny. This could take 12-15 minutes. When soft peaks have formed, pour into the prepared pan and spread evenly using a spatula lightly coated with oil. Smooth the top and cover evenly with the crushed peppermint pressing into the marshmallow. Cool completely for 6 hours or overnight. Whisk together a mixture of the confections sugar and cornstarch for dusting. Dust a work surface very lightly and turn out the marshmallows from the pan. Remove the parchment and dust the bottom with the sugar/cornstarch mixture. Turn over and cut into 1½ inch squares. Continue to dust the cut sides with sugar/cornstarch mixture. Store in an airtight container for 1 month, makes 48 marshmallows. Halloween isn’t just for kids! So we decided to put together a unique bourbon candy bark made only for adults. 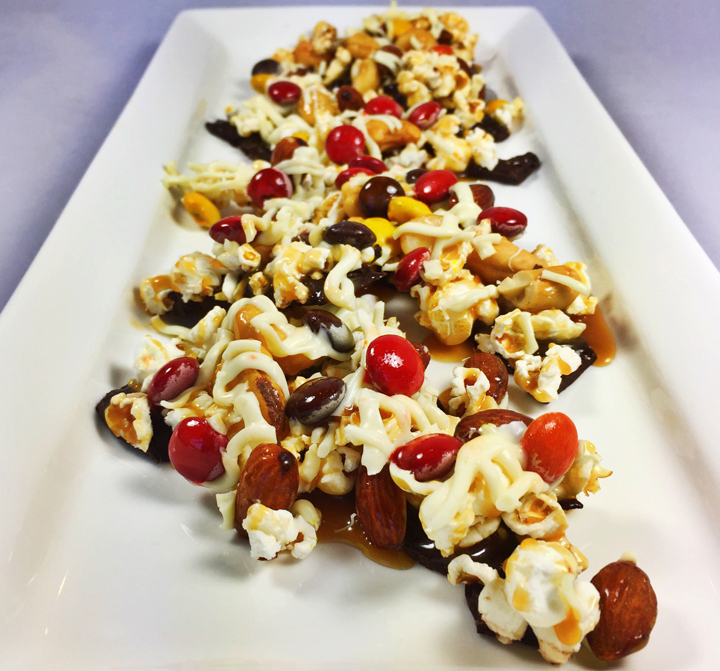 Perfect for your grown-up party, this sticky, gooey treat is made with popcorn and dark chocolate bark drizzled with bourbon caramel and topped with mixed nuts, white chocolate and topped with festive harvest blend M&M candies. Line a sheet tray with parchment paper or a Silicone baking mat. In a metal bowl set over simmering water, (water should not touch the bowl) add the chopped chocolate and stir to melt completely. Spread very thinly over the parchment or mat, and immediately press the popcorn into the chocolate. Refrigerate 15 minutes to set the chocolate bark. Add the caramel to a saucepan and heat until warm and smooth. Stir in the bourbon and remove from the heat; cool slightly. Drizzle the caramel over the popcorn, immediately top with the nuts over the caramel. Refrigerate 15 minutes to set the caramel. Set another metal bowl over the simmering water, add the chopped white chocolate and stir to melt completely. Remove from the heat and add to a plastic bag. Cut off a small corner and pipe the white chocolate over the nuts, immediately top with the M&M’s. Refrigerate 1 hour to set then break into large pieces and serve immediately.